Names of judges, bailiffs, and jurors in Hood County court cases from 1884 through 1900 are chronologically listed. 157 pages from an original bound book, containing approximately 2,000 names of Hood County citizens, have been graciously transcribed by Mary Maxwell of Midlothian, Texas. This information is profoundly significant since most of Hood County's 1890 Federal Census was destroyed by fire in the National Archives in 1921. Former Hood County Judge Milton Meyer found a quantity of old jury scrip notes laying around in the Hood County Courthouse sometime in the 1970's. 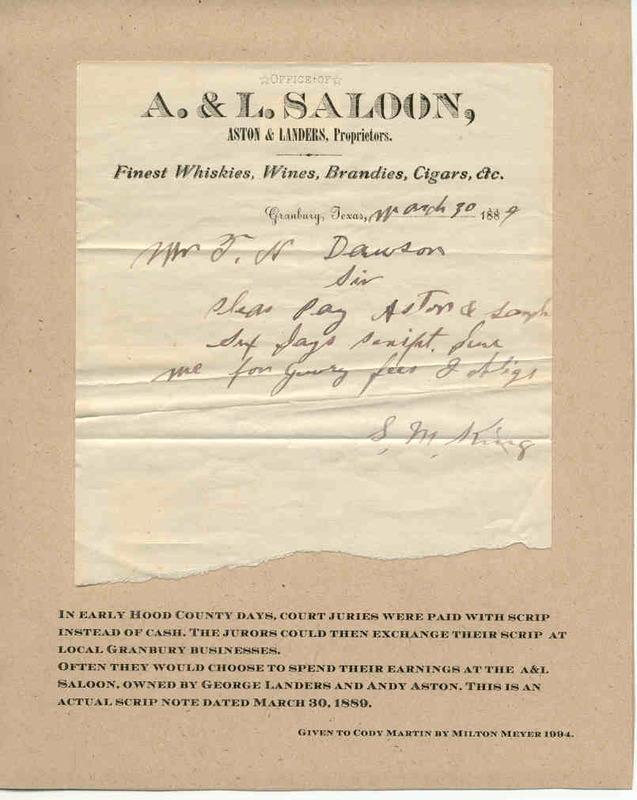 Judge Meyer knew that W. Cody Martin was the great-great-grandson of George Landers of Granbury's Aston & Landers Saloon (A&L Saloon), so he gave Cody one of the jury scrip notes. Juries were paid with scrip instead of cash to be utilized at local businesses. Some of the jurors redeemed their earnings at the A&L. Following is an actual jury scrip note issued on March 30, 1889.